Santiago, the original capital of Cuba, was founded in 1514, and is today the centre of the province of Santiago de Cuba in the southeast of the island, 485 miles (780km) from the present capital city, Havana. One of the most picturesque cities in Cuba, it is notriously hilly with sloping streets, nestled between the coast and the Sierra Maestra mountain range. Santiago boasts a number of monuments and museums associated with Cuba's long struggle for national independence. The city also claims to boast the oldest home in the Americas, the Casa de Diego Velazquez, the residence of the Spanish governor of old, which is a highlight of the city's historic quarter. Santiago is a diverse city, with many population groups, often in quite distinct neighbourhoods, including the French-Haitian district of Tivoli. The city is known for its annual carnival, which is actually bigger and more riotous than Havana's version (it did come first, after all). It is also blessed with closely situated natural wonders, including the 80,000 hectare (197,684 acre) Baconao Park, which begins in the city and ends in the lagoon of the same name. 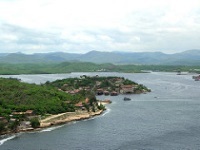 Santiago de Cuba is climatically the hottest part of Cuba, with average temperatures of 90°F (32°C), so visitors should go prepared for heat, especially in the summer months. We are looking for contributors for our Santiago De Cuba travel guide. If you are a local, a regular traveller to Santiago De Cuba or a travel professional with time to contribute and answer occasional forum questions, please contact us.